Ivory James' Cm Once Ina Bluemoon qualified for the $17,500-added Baxter Andruss Futurity Sunday afternoon at Portland Meadows. PORTLAND, OR�NOVEMBER 26, 2017�Cm Once Ina Bluemoon, a 2-year-old Oregon-bred son of multiple stakes sire IVORY JAMES, posted the fourth fastest time for the Baxter Andruss Futurity Sunday afternoon at Portland Meadows. Ridden by jockey Luis Gonzalez, Cm Once Ina Bluemoon completed the 400 yards in :20.355 seconds over a sloppy racetrack to earn a 90 speed index. Trainer Nic Lowe conditions the bay gelding for himself and breeder Randy Dickerson. Out of the Jess Louisiana Blue mare Cool Blue Corona, Cm Once Ina Bluemoon has compiled a (8) 2-2-1 record this season and banked $17,720. 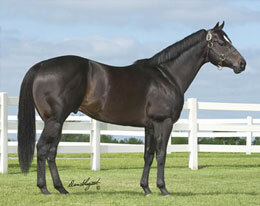 He was a finalist in the $129,100 Wild West Futurity at Los Alamitos and the Bitterroot Futurity in Idaho earlier this year. The 10 fastest qualifiers will return to Portland Meadows on Sunday, December 17th. For a complete list of qualifiers, times, sires, dams, owners, breeders, trainers and jockeys CLICK HERE.